Having three children of my own, I’m familiar with the comings and goings of the tooth fairy. As assistant to this magical fairy, my wish that the exchange of tooth for a coin be a little more special has been granted. If you too ever wished the tooth fairy left more than a coin – imagine a letter from the tooth fairy! The Tooth Fairy Dream Kit from Underpillow is a dream come true for people wanting to really celebrate the milestone of losing that first tooth and the many more that follow. 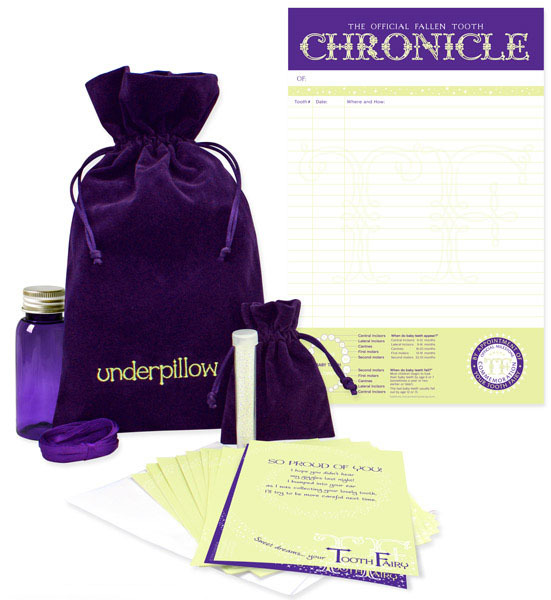 The Tooth Fairy Dream Kit includes twenty-three unique letters for your child from the tooth fairy herself (or himself), a velvet mini pouch for keeping a lost tooth safe under a pillow, a vial of fairy dust, purple storage bottle, satin ribbon and a chronicle to record each tooth lost. All this is contained neatly in a luxurious satin lined velvet pouch. Children will love the magic that this kit brings, making it a fantastic gift and something perfect but different for baby showers. The Tooth Fairy Dream Kit costs $38.50 from Underpillow. Delivery is available Australia wide plus to most international destinations. You can find some more of our ideas for the tooth fairy here.